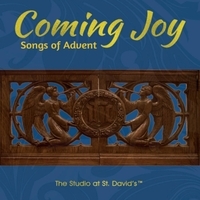 A unique album for Advent that expresses the anticipation of Christ, the King. Advent (from the Latin for ‘arrival’ or ‘approach’) is most often thought of as a four-week season of preparation for Christmas, the celebration of the birth of Jesus Christ. This is correct, of course, but it’s only part of what the season is about. Rather, Advent most broadly understood is nothing less than the coming-near of the Kingdom of Heaven, which is to say the gradual unfolding and unveiling of the eternal existence, ways, and purposes of the Lord. As such, Advent comprises many layers: Christ’s role in the creation of the cosmos; the Hebrew prophets’ blazing visions of the restoration of the People of God and the extension of divine justice, mercy, and love to all nations; the coming of Christ in human flesh; the beginnings of His adult ministry; His continual visitation in grace to the hearts of those who seek Him; and above all, the final, full revelation of Christ, His Kingdom, and the reconciliation of all things.